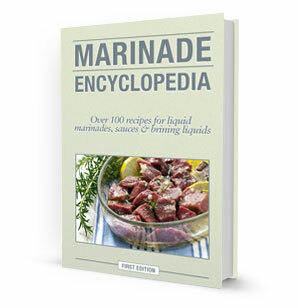 The Marinade Encyclopedia brings you over 100 recipes for liquid marinades, sauces and brining liquids. A marinade is a seasoned liquid, rub or paste, often acidic, applied to poultry, meats, seafood or vegetables before cooking to add flavor, or to tenderize tougher cuts of meat. 113 pages filled with mouthwatering recipes such as Asian Citrus Marinade, Basil Balsamic Marinade, Beer Marinade for Beef, Caribbean Mango Marinade, Cuban Mojo Marinade, and much more! Every recipe includes suggestions for what food to use the marinade with and how long it should marinate. Try Asian Citrus Marinade on pork chops; Cuban Mojo Marinade on chicken; or Honey Lemon Marinade on fish fillets. You'll love the zip and zing these marinades bring.